I’m always looking for ways to get my kids to play with the toys they already have. Sometimes all it takes is a new way to play with them. That’s what happened when my family got the new Thomas Super Station from Walmart. We got our wooden train table when my oldest was 18 months old. He always spent a long time at the train table exhibit at our local children’s museum. So, we found one used and I was in awe that he would play there for hours by himself and I could actually get stuff done around the house! He’s been solidly playing with his Thomas trains for years. It’s great because that’s what my family usually gets him for birthday or holiday gifts. But, they don’t always understand how many different train sets there are and we now have a mix of Wooden Railway, TrackMaster, and Thomas & Friends Adventures. 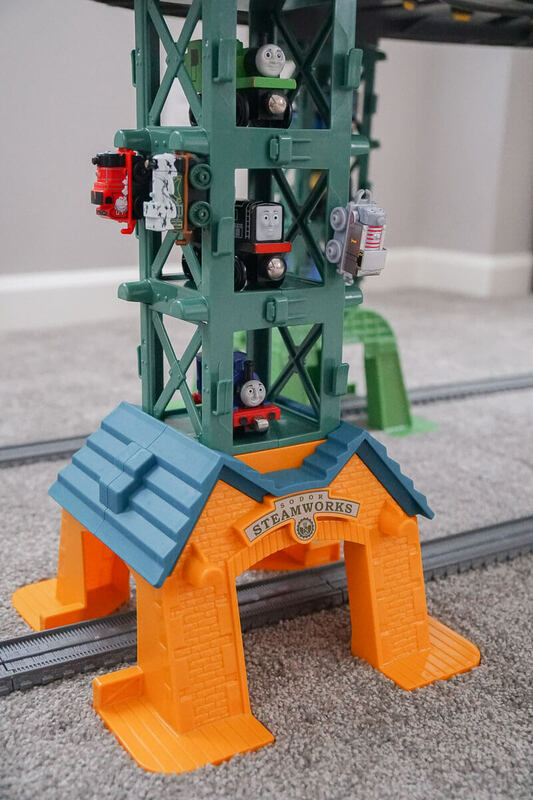 The number one reason I love the Thomas Super Station is that it can be used with any size Thomas engine! This set comes with pieces from Wooden Railway, TrackMaster, Thomas & Friends Adventures and MINIS. We were so excited to see that it worked with mini trains! If you have a Thomas the train advent calendar, they come with mini trains. Now you can use them to decorate this set. It works with the MINIS trains from those blind bags, too! If you have been gifted random Thomas trains, chances are they will work on this track. We had a huge supply of trains of all sizes that we tested out, including really old trains that we were gifted from friends plus a set from Japan! 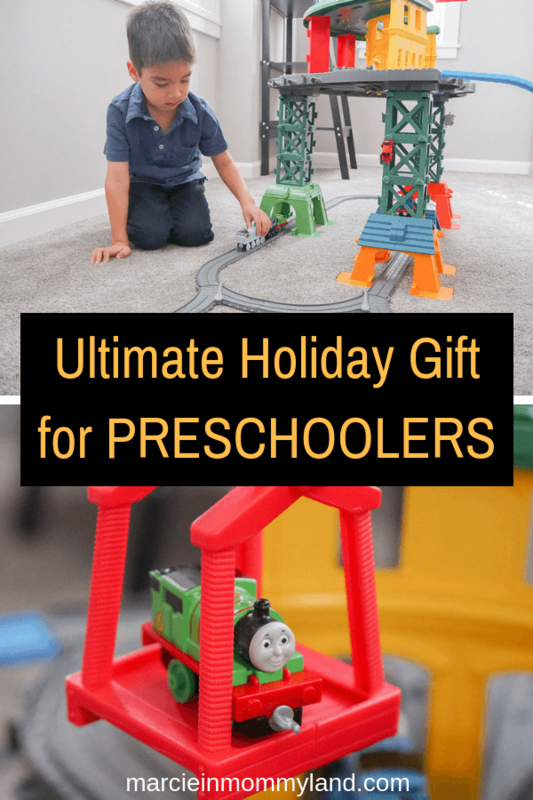 So, that means your child can add any Thomas & Friends set to their holiday wish list and you won’t have to worry if it works with the Thomas Super Station. Setting up the Thomas & Friends Super Station was pretty straight-forward. It comes with a detailed instruction booklet. Everything is labeled pretty clearly and it took us about 25 minutes to assemble it. My husband and I set up the actual station part and then our 4 year old was in charge of the tracks. I loved how the train tracks have clearly marked numbers on the back (like S2, CS, etc.) My preschooler followed the instructions to build the track design. Since there are a few ways to configure the Thomas Super Station, it was nice that we could try out a few track options. 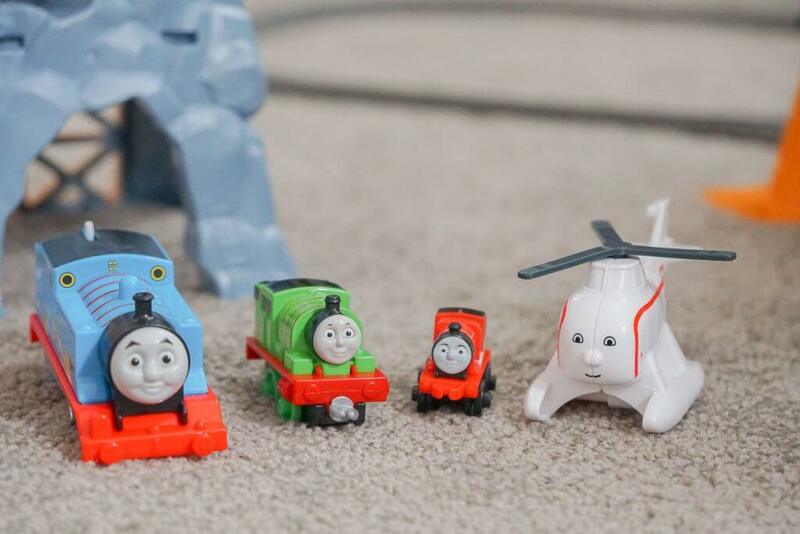 Remember when I said that the Thomas Super Station is compatible with all the Thomas & Friends trains? The track is ALSO compatible with Thomas & Friends tracks you already own. 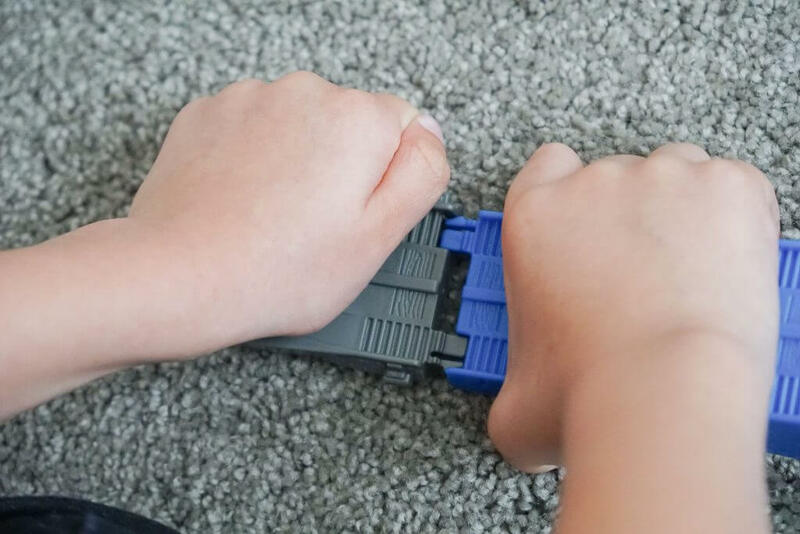 This set comes with track adapters that you can use at the ends of the ramps. We call this the “special piece” in our house because it instantly transforms the entire play set. We have a ton of wooden train tracks that we can now play with in a new way. 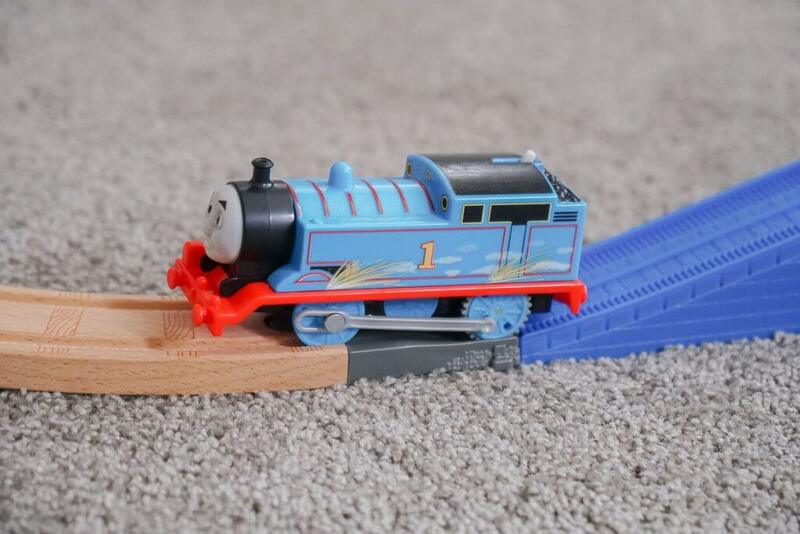 As I said before, there are multiple ways you can configure this Thomas playset. But, if you are short on space, you can even remove the legs to create a micro-layout. 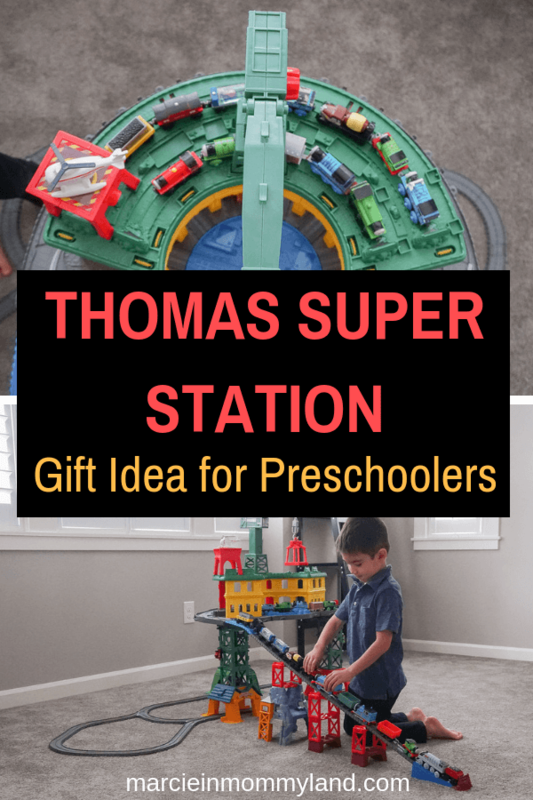 The way the Thomas Super Station is designed, kids can store more than 100 engines of different sizes. There’s even little spots to attached MINIS vertically! 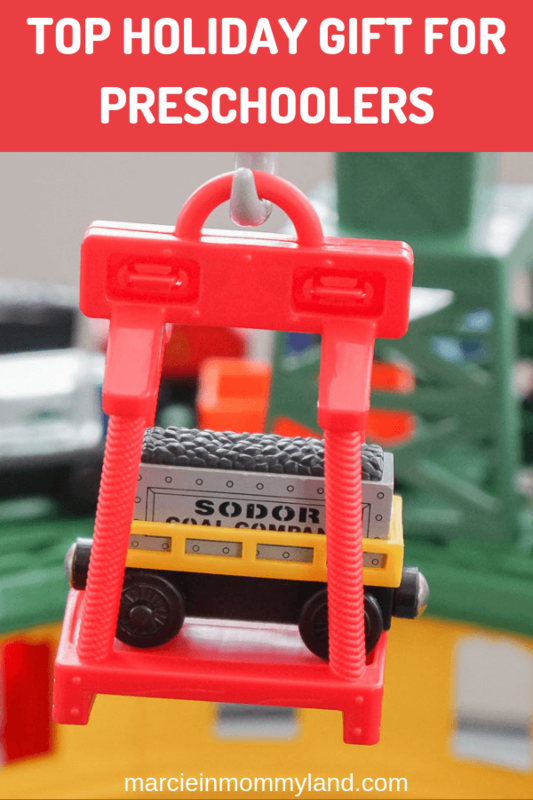 Plus, you get more than 35 feet of track, cargo pieces, adapter pieces, two racetracks, floor play and more! 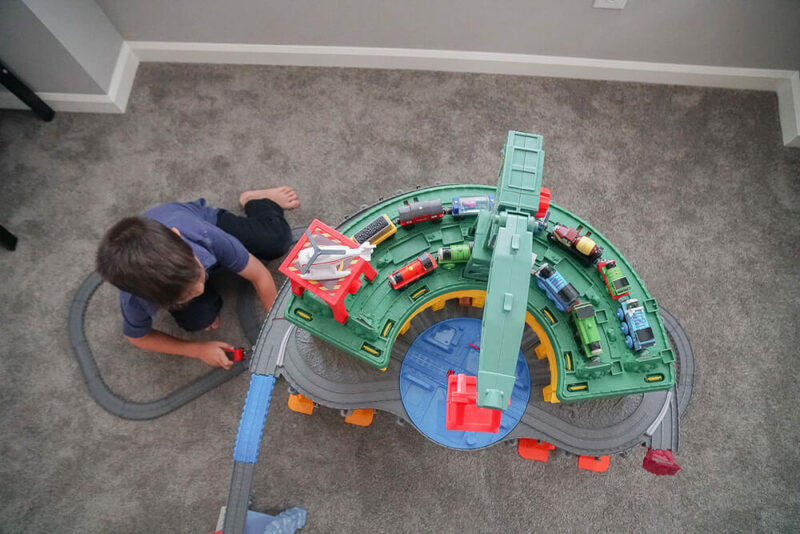 We’ve had this Thomas & Friends Super Station for more than one month and it’s still getting lots of daily use. He really likes playing with Cranky. His crane can go up and down and has a cargo lift. My son likes to put engines in the cargo lift. Plus, there’s a stop-track lever on the turntable. 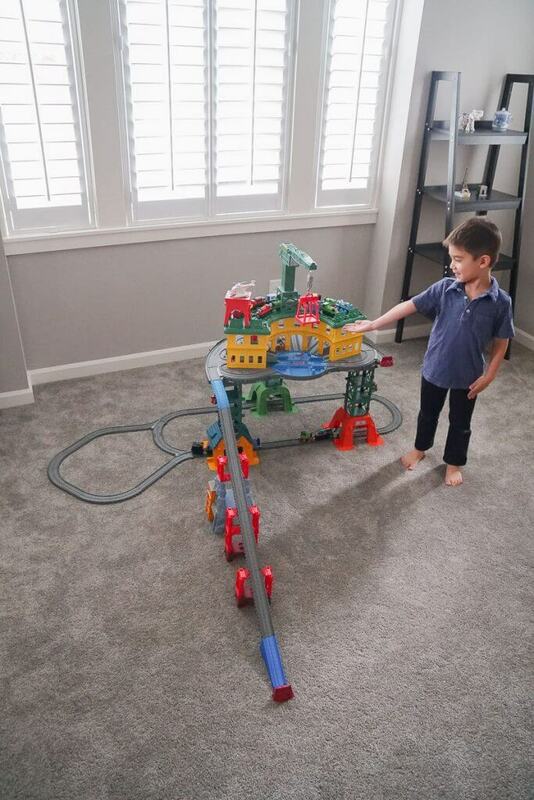 My son has a lot of fun using it to stop his battery-powered TrackMaster trains and have the switch directions. He even insisted that we pick up a few more MINIS to “decorate” this playset! Before we got the Thomas Super Station from Walmart, my oldest wasn’t playing with his trains as much as he used to. But, now he’s excited to play with it every day! 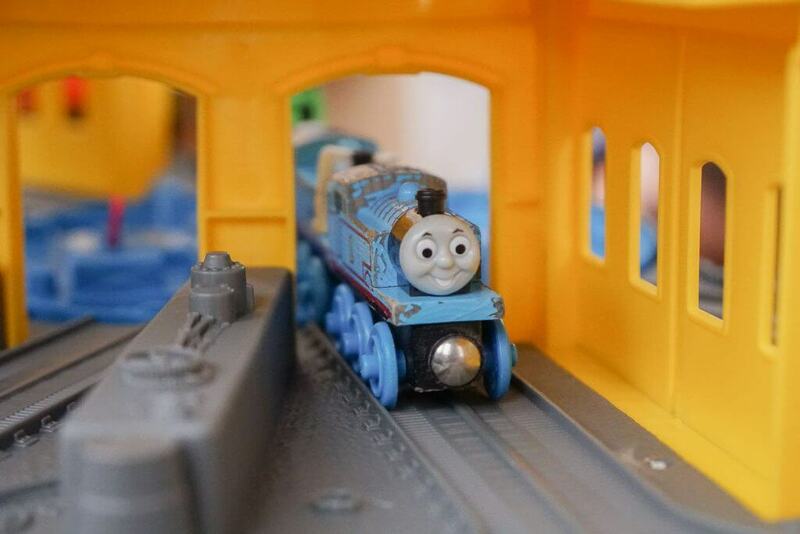 We’re also getting much more use out of all our Thomas playsets because they are compatible. 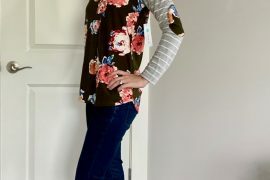 And it’s been a huge hit for play dates! There’s enough room that several kids can play with it at the same time. Plus, I’ve noticed that with the track adapters, the kids can play with the Thomas & Friends Super Station while others build more tracks featuring other playsets! 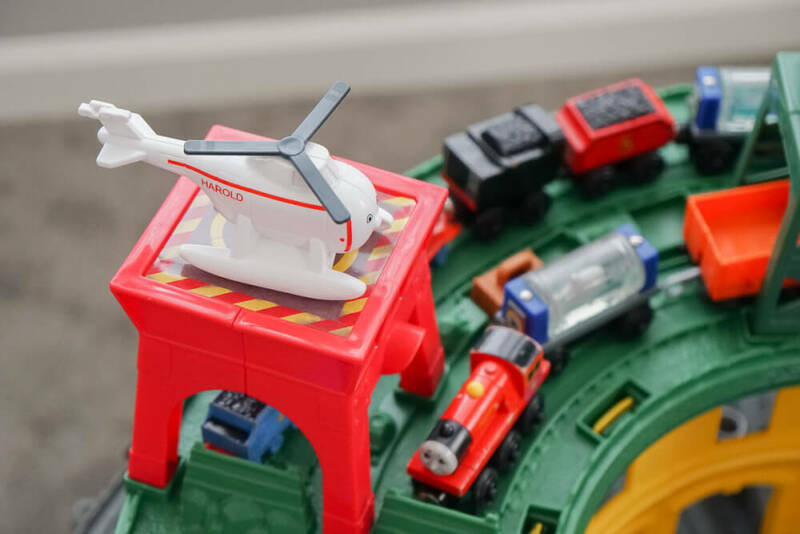 With my toddler being train-obsessed, I know we’re going to get several more years of play out of it! This is such a great toy! I love how many different configurations you can make with the tracks! I know, right? Plus you can add on your own tracks for endless possibilities! My oldest is getting to the age where a train track would probably be a lot of fun! Do it! 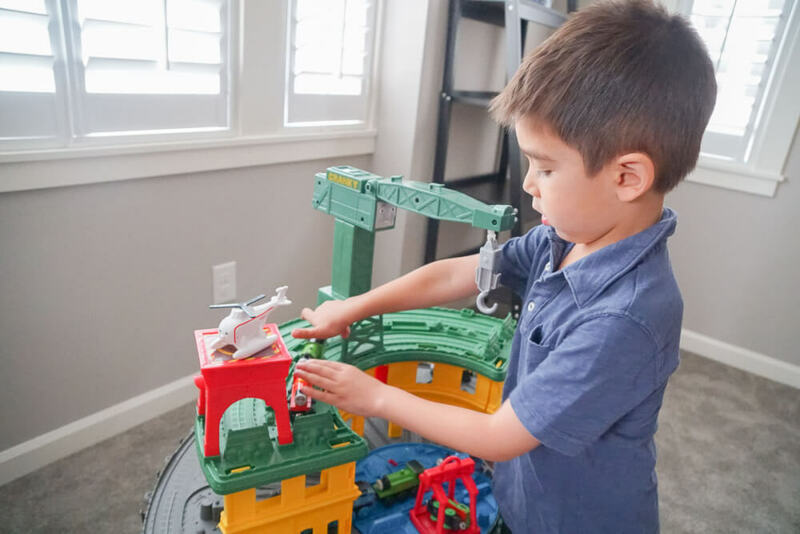 Playing with trains is so good for their brain development! My kids love putting the tracks together because it’s like a puzzle! Very cool toy! I’m sure they will enjoy it for a very long time! So far, it’s been the main thing they play with every day! My host kids are too old for this but it still looks like an amazing toy! You can just keep expanding on it! Exactly! My kids have replicated almost all of Sodor right now! 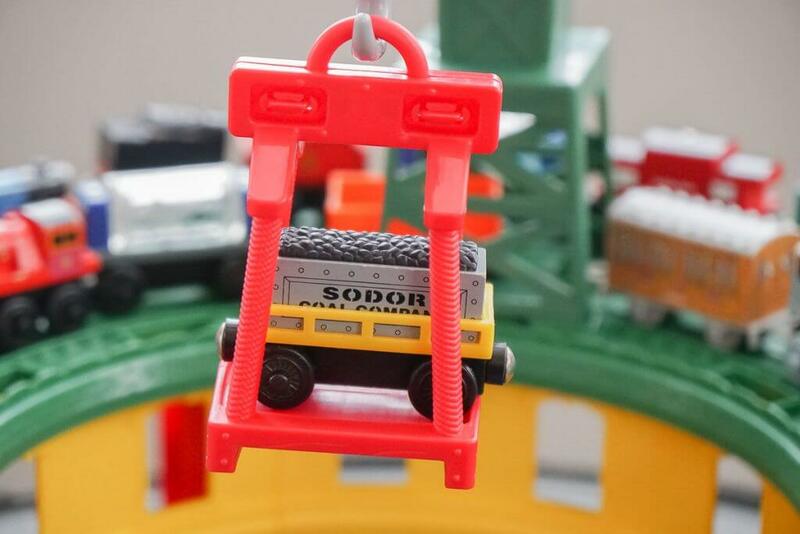 Most of the kids love the trains, This would be a really cool gift for anyone. A kid will never be bored with this, it can have so many configurations. 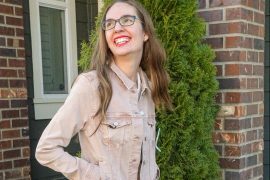 Yes, I like the versatility because we can keep changing it up for a different experience! Oh I’m sooo glad to see Thomas the Tank Engine is still thriving! I loved it as a kid. We love how playing trains helps with spacial awareness and problem solving! Such a fun toy. My son would have loved this when he was little. He loved Thomas the train but has since out grown it! I feel like all kids have a Thomas phase in their childhood! My daughter really loves riding on a train that is why she loves Thomas so much and I am sure once she sees this she will ask me to buy it for her. Haha! My kids are all about riding trains, too! Thomas is one of the best toy that my daughter’s love and I am sure she will love to have this for her birthday. It’s so universal for all kinds of kids! My son loved playing with Thomas the Train toys when he was younger. He could play with them all day! Right? I think they are timeless! What a collection he has! Reminds me of my brother when he was younger he had to have Thomas the train EVERYTHING! Haha! That’s how my boys are now! I can think of someone right now that would like to have the Super Station. I may have to get it for them for Christmas. Do it! You will be a hero! In the first look, I thought that it was made of Lego blocks. This is such an amazing toy to keep kids occupied for hours! Yes, it has the same bright colors as LEGOS! 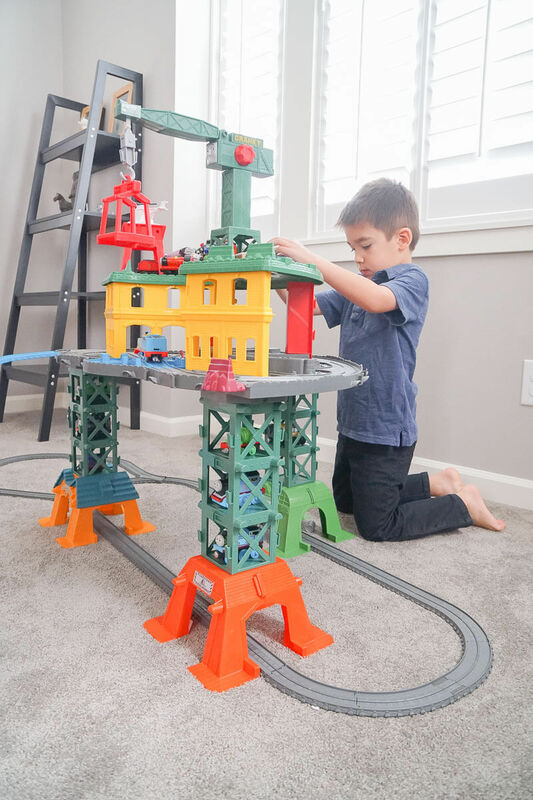 This Thomas Super Station set is so beautiful and I am sure my son will love to have this. It’s been a hit on play dates! Looks cool. I will share this with my mommy friends! It’s a really fun toy! 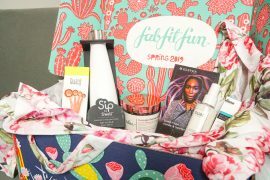 It’s a hit with boys and girls! 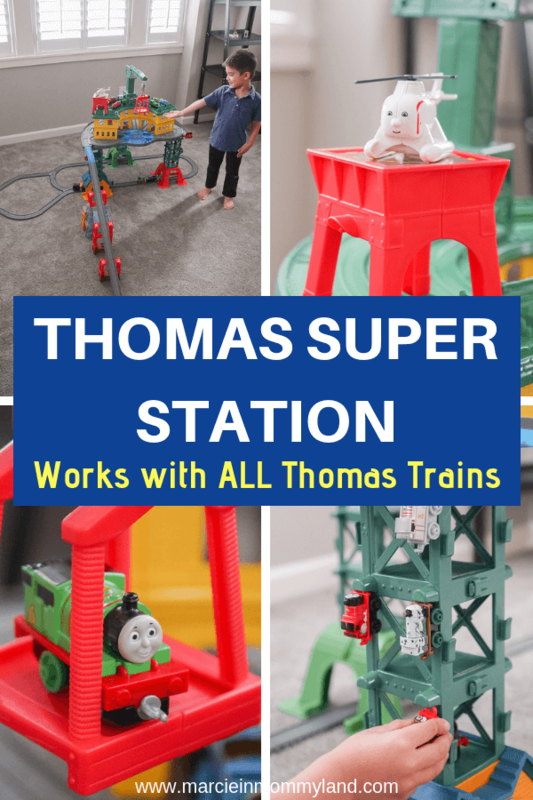 Most guys like vehicles such as cars, aeroplanes and trains, so this Thomas Super station is definitely many boys’ dream toy when they are young. I like how they are big and doesn’t have small pieces that will be dangerous! Yes, my boys are completely into all vehicles!